If you have ever been to this site before, it may be very obvious that most of the programs I watch are older British series from the 1950s to 1990s. 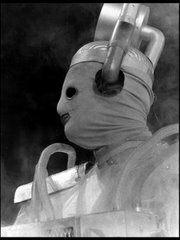 It is the era I really got into British television as a kid so it still holds a very special place for me. Watching programs from the twenty-first century seems almost weird to me but the good news is that there is a lot of good British television being made. 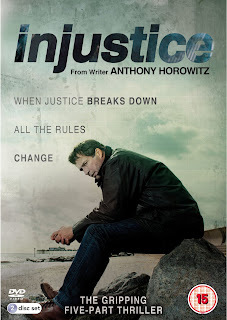 I know a lot of people (and some friends) that say “they don’t make ‘em like they used to.” I personally think that is the case with the comedies but when it comes to thrillers like Injustice, they have never made them better. There has to be something said about a program that starts out one way and completely takes you on a journey that you didn’t expect. It is done without any pretention. It is a story that takes all of us on a roller coaster of intrigue and tragedy. Two murder cases going on at the same time with each investigator looking for a murderer and crossing the other’s path. The outcome is satisfying but not expected. 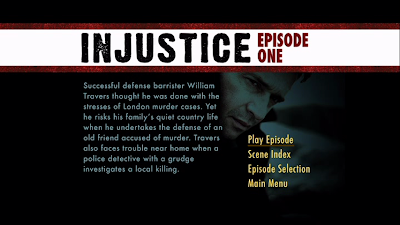 Injustice was a series that ran in the UK from 6/6/11-6/10/11 on ITV. This particular series was outside my radar mainly because it was shown over here in the US on DirecTV which is not something I subscribe to for television viewing. I wonder how many people know about this series? Hopefully with the help of this article, more people are interested in checking it out. The series was created and written by Anthony Horowitz. As it happens, he wrote some of the episodes from the last review I did which was Poirot. Of course, he did a lot more than that. Horowitz created Foyle’s War (another must-see). He wrote episodes of Midsomer Murders and will be writing the screenplay for the sequel to Tintin. Of course, some fans will never forget (or forgive) that he also created the series Crime Traveler. Some people like it and some people don’t. This is just a little bit of his output. He is very accomplished and has a massive body of work not only on television but film and in books. This is a difficult series to write about as so much that is happening all leads to the conclusion of the series and I would be horrified if I ruined it for anyone. I have been wracking my brain to figure out a way to convey the series without ruining it for anyone who wants to see it. 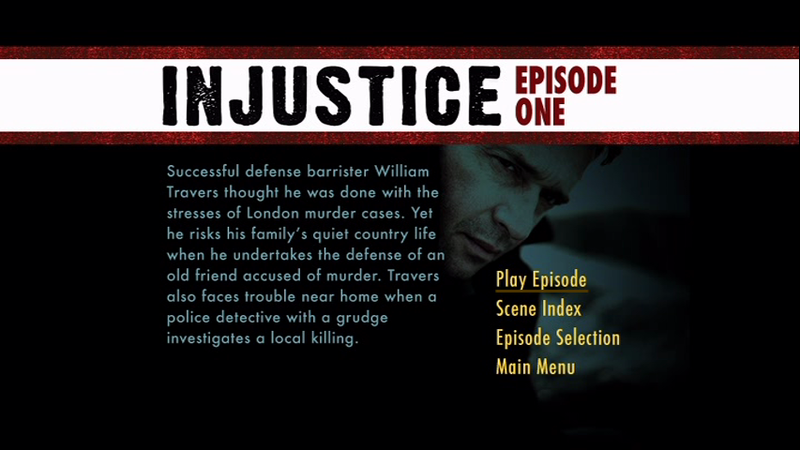 The series centers around a Barrister by the name of Will Travers. 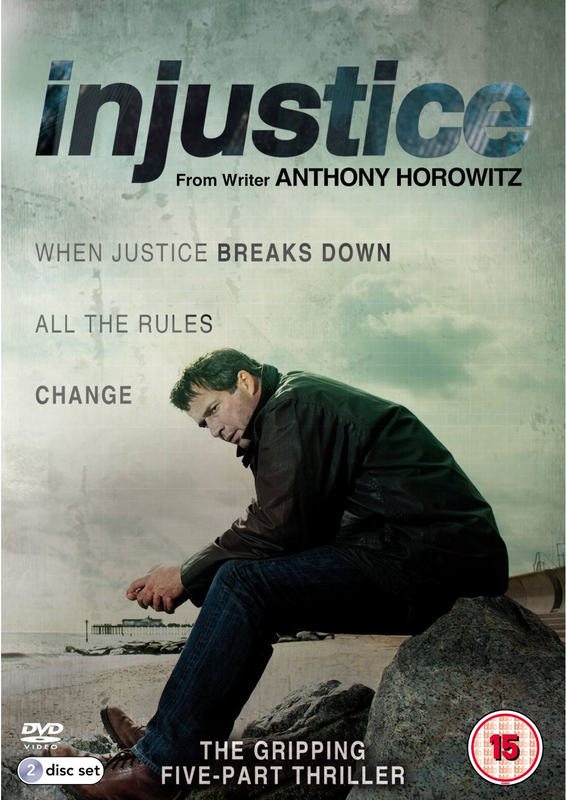 He used to take the defense on murder cases but something happened to Will that changed him. He was a very promising lawyer in London but Will got ill, if you will, and stopped defending murderers. At the beginning of the series, Will is defending a young black man who is accused of stealing a man’s war metals. The young man was innocent and it looked like a sloppy case by the police. In fact the partner of Police DS Wenborn ends up being put on suspension because of how poorly he handled the case. Wenborn has an immediate dislike towards Will because of the case he put together against Wenborn’s partner but Wenborn himself is a nasty piece of work. Soon Wenborn is put on a murder case with a new partner. He doesn’t care how he obtains results as long as he obtains them. His commanding officer doesn’t care either; he knows that Wenborn will get what he wants. Even if it means cruelly threatening teenagers, insulting old women, or tampering with evidence or where evidence comes from. Oh, he also beats his wife, ridicules her and cheats on her. He really knows how to hold a good marriage together. Of course he doesn’t! He is a horrible husband. His wife tries real hard to be supportive but she is fighting a losing battle. On the other hand, Will Travers is much luckier with his wife Jane. Jane is a very well-educated woman who used to work in the publication business when they lived in London. After Will had his breakdown and they moved to Suffolk, she gave up that life. One thing she does do is go to the local youth prison and have a reading group with a few of the inmates. One young boy is very smart. His name is Alan and he actually can write. He wrote a few chapters of a book and handed them off to Jane who took them to a publisher that is trying to woo her back to work in London. He loves the chapters! They seriously want to publish Alan’s book. Jane is a very loyal and supportive wife to Will. They have been together for a long time. Layers of the story reveal themselves to us over the course of the episodes. One thing is clear is that while in college, Will stole Jane away from their friend Martin Newall. Martin has just been arrested for murder in London and there is only one man he wants to represent him. Martin works for Qestral, an oil company, in which he was having an affair with a very young secretary named Lucy. They went to a hotel in London one night. 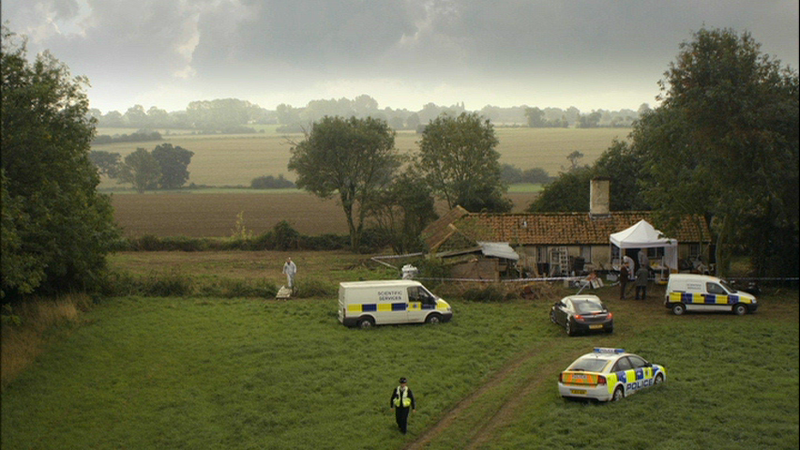 Martin went to get some food for Lucy and when he got back she was murdered….strangled. 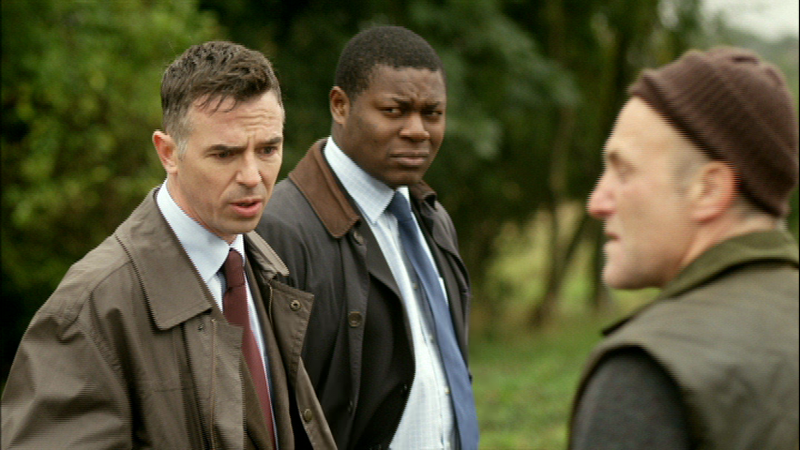 Martin knows that Will would be perfect for this case as he would be able to prove Martin’s innocence. One thing that is made clear during the investigation is that a Qestral computer belonging to Martin was stolen from the hotel room that night. What is the significance of this computer? Jane does not want Will to take on this case even though Will, Martin, and Jane all went to school together. Will decides he is well enough to take on the case and starts the investigation that takes him to many different places where he finds out more about Qestral. Meanwhile, DS Wenborn is investigating the death of Philip Spaull who was an activist who would resort to violence if it was necessary. Spaull was shot execution style point blank in the face. Wenborn does a lot of investigating until he realizes that there is a connection between Spaull and Will Travers. What is the connection and how could Travers who is an upstanding Barrister have anything to do with this character Spaull? Everything I mention above is all connected in some way. The fun is to see how they are connected and how they get resolved. Oh, did I mention that Travers is often visited by the spirit of an 8 year old boy? This series is about multiple stories that cross-over each other multiple times over the course of the episodes. I am sure much I have written about this series sounds clichéd but it is anything but that. I watched trying to figure it out and there were some truly shocking and unexpected twists and turns to this series. After I got to the end of Episode Two, I knew needed to see the rest. Even though the story is disjointed (to heighten the mystery), it plays out very well. I just want other people to watch so I can talk with them about it! James Purefoy plays Will Travers. Purefoy played Mark Antony in Rome and was in A Knight’s Tale. He was also a contender for James Bond when the film series returned in 1995. 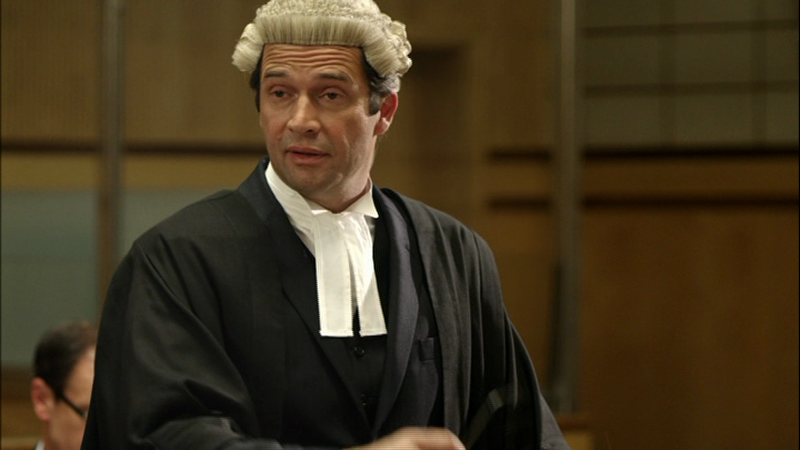 Purefoy plays Will in a very calm and underrated way. He is gentle and fair. Yet, why is he the focus of an investigation? Dervla Kirwan plays Jane. Kirwan is known for her role as Phoebe Bamford in the BBC comedy Goodnight Sweetheart and also Miss Hartigan in the Doctor Who Christmas special, The Next Doctor. These episodes look great and they should. The series was shot in either 2010 or early 2011. The only thing that bums me out a little is that there is no Blu Ray release of the series. As far as I am concerned if the series is made in HD, it should be released in HD. It is fine if there is a DVD release too but I would like to get the series made in the format it was broadcast. I doubt this had anything to do with Acorn Media. It is released in the UK only as a DVD with no Blu Ray option either. Part of me wonders if it was released over here only on DVD since maybe not a lot of people are familiar with this series. It’s one possible explanation. The only extra on this DVD is the photo gallery. I am not a big fan of photo galleries but this one is alright. It plays through the photos itself with no option to jump ahead but it is played over the theme music to this series. What I also like is that these are photos from a photo shoot with the characters instead of just screen grabs from the episodes on the discs. I have seen that before and am always disappointed to see that happen. Not that this is an extra per se but I am pretty impressed when you pick an individual episode from the menu it gives a synopsis of the episode on screen. I think it’s a nice touch especially if you watch this over a period of time instead of all at once. It helps you get caught up. I think this release has a striking cover with Will Travers on it. It doesn’t give away anything about the series. In fact, I would have thought the series would have had a different tone and feel based on it. I also think it is a lot better than the UK cover for the series. Honestly, you don’t need to be a fan of British television to dig this. If you love mystery and a good suspense thriller, this is very worthwhile. It’s a very smart and stylish production. Just check out the awesome artistic opening credits! They are wonderful. 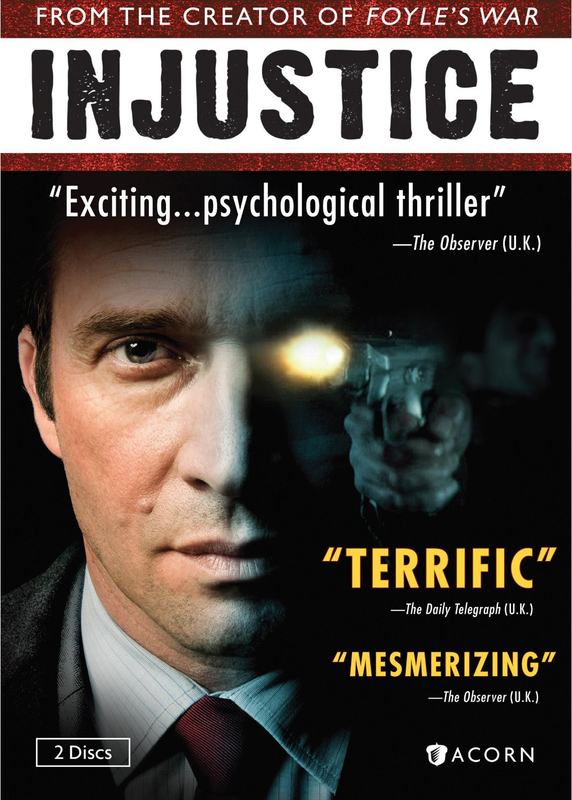 Give this intelligent suspenseful series a try and you will find out the real meaning to why this series is called Injustice. Coming Soon: In a couple of days I will post DVD reviews of Acorn’s release of Young James Herriot and BBC Video’s Absolutely Fabulous: 20th Anniversary Specials. I am also going to resume regular non-review articles in a week with a tribute to Geoffrey Hughes who played (amongst other things) Onlsow from Keeping Up Appearances. I am really looking forward to your thoughts on Young James Herriot. I never got around to watching this and am a bit afraid that it will not be anywhere near the great wonderfulness and wonderful greatness that is All Creatures Great and Small. I much liked Horowitz's Collision as well. Speaking of prequel's, I enjoyed Endeavour and am interested in seeing Young James Herriot. Looking forward to Call the Midwife and Parade's End. By the way, loved the Forbrydelsen meets Ab Fab scene in the recent Ab Fab specials. Nice to see you around!I enjoyed that scene in Absolutely Fabulous too! I hope all is well with you!